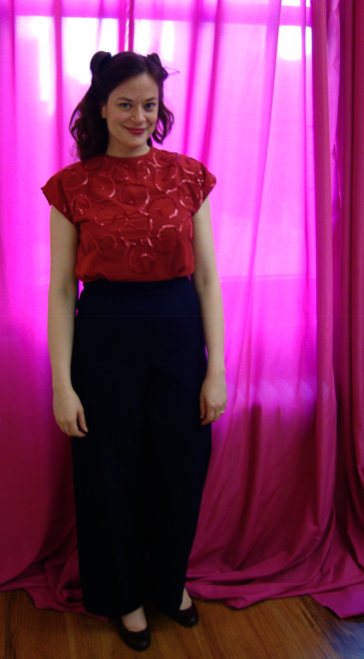 I am very excited to have finally finished my 1940's sequined blouse. You may recall that I started this blouse back in May and I had some time while I was on vacation to add the final sequins and put the blouse together! I used McCall 1192 as the pattern. I've always loved the look of 40's bedazzled blouses and was super happy to have picked this pattern up for cheap. It required 12 metres of sequins! I made the blouse out of a lightweight and drapey polyester fabric (which was very difficult to cut--it kept wanting to slip around!). All in all, it took over 20 hours to apply all the sequins and to put the blouse together. 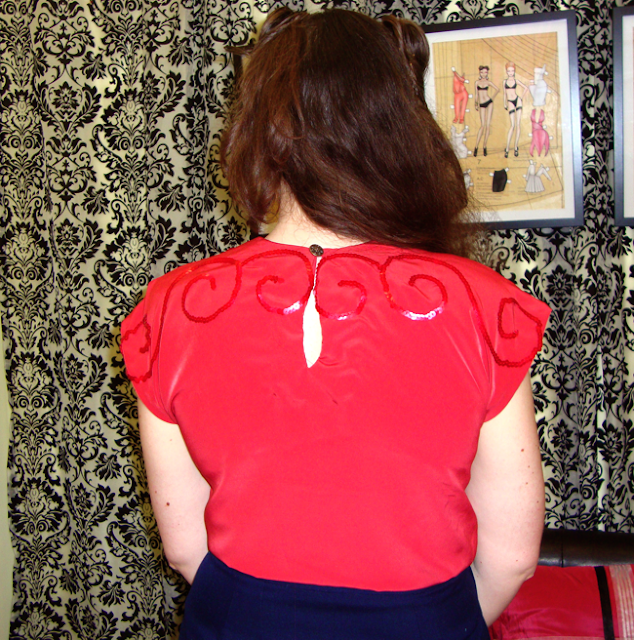 The actual process of sewing up the blouse was super quick as it consists of only two pieces and two facings. I was a little unsure at first if the iron-on transfer would work. But it wasn't a problem--in fact, I think these can be used multiple times (especially on lighter fabrics). The design was pretty easy to follow. Though as you see not all the curly-q's are connected, meaning I had to start and stop and finish off rows of sequins quite a few times. 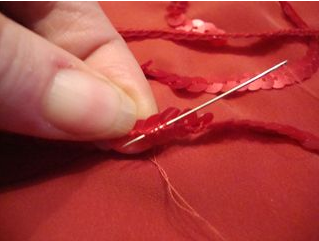 This made it take a bit longer because it was often tricky to fold the end thread under a row of sequins to finish off a row! I used strands of sequins on this blouse. You can use either strands or sew individual sequins on (though that would take a CRAZY amount of time). It's great that you can buy strands already to go. It took a little bit of time to get used to making circular shapes (without it looking too wonky). 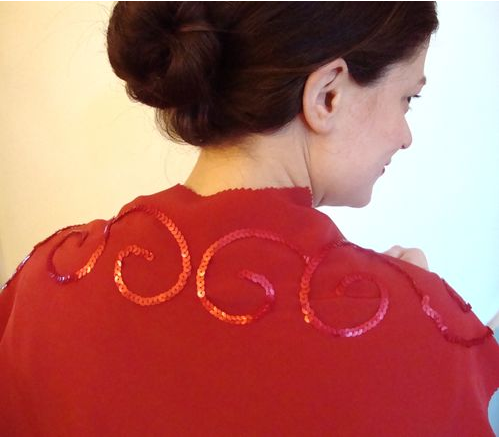 I am really, really proud of the sequins on the back! Though in retrospect, I could have left a bit more room between the sequins on the centre back for the neck opening! Here's what it looks like all sewn up. These photos were taken at the Sewing Studio in New York City. You can see it was a tight squeeze getting the opening between the two circles of sequins. It looks a bit gapey in the photo but I think I can fix this with a good pressing to get the centre back opening to line up better. 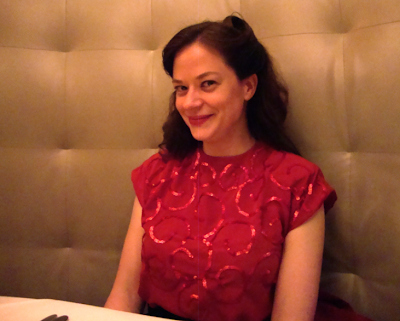 I wore this blouse to a night on the town in New York City and I absolutely love it (I'm even wearing it now as I type!). I added shoulder pads to get more of the 40's shoulder silhouette. YAY for sequined blouses!!! 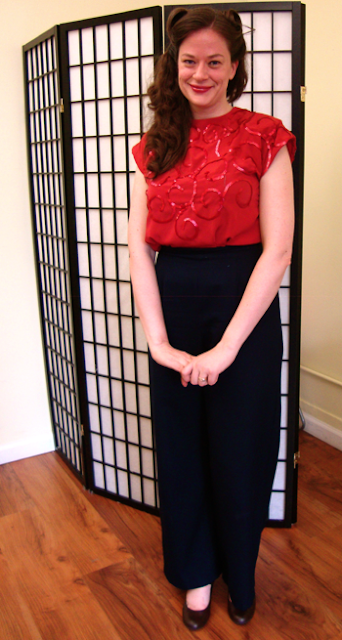 I am definitely going to make more of these types of garments in the future--they are so much fun! I'm delighted to give away my copy of McCall 1192. 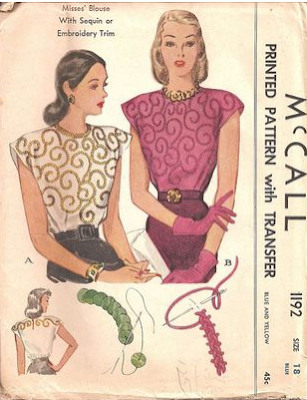 It is a size 18 or 36 bust and includes the directions, the pattern for the blouse and the iron-on transfer for the sequins. I can't guarantee that the iron-on transfer will work again but it's worth a try. Either way, the design is there and could be easily traced onto your fashion fabric. This giveaway is open to everyone. Just leave a comment on this post by Saturday midnight (London time) for one entry. You can also do a blog post on this giveaway, tweet about it or put it on facebook for an additional entry for each method (up to four entries total). Just come back and leave me a comment that you've done all those. I'll randomly pick a winner on Sunday. It would be great if you could leave me some way of contacting you in your comment! The only restriction of the giveaway is that you do not sell this pattern. Keep it for as long as you want and once you are done--pass it along to someone else! I love comments--so feel free to leave a comment even if you don't want to be entered in the giveaway! Just let me know your preference in your comment! Thank you everyone for your lovely comments while I was on holiday! I'm enjoying reading all of them and catching up on all your wonderful creations! Oh, it's gorgeous, and yes, I do remember back in ?May was it? when you showed us you were planning to make this blouse. Success! It looks movie star classy, well done with all those little shimmery strands of sequins! PS I wouldn't have the patience to apply all those sequins so you'll have to count me out for the giveaway. Debi, this blouse looks stunning on you! I'm in awe of the hours and effort that went into it, but it all paid off in the end. It's truly beautiful. I would love to own something this elegant, so please do enter me into your giveaway! Many thanks! Beautiful job, Debi! It looks wonderful -- and not too vintage-y (not that there's anything wrong with vintage-y). So glad we got to meet last week! Love the red on you, very youthful! You have more patience than I sewing on all those sequins, but the end result IS fabulous. Please don't enter me in the drawer, this deserves to go to someone who will sew it before 2040! what a great feeling to finish that kind of UFO! amazing work! You did a gorgeous job on this blouse--I love it! Absolutely gorgeous! You look amazing. You look so vibrant in that colour. I'm not sure I'd have the patience to do the amazing handwork that you've done, but it may be worth it. Stunning as always. How time flies! I can't beleive you started this project last May. Peter is right, though I love vintage styles this blouse is not out dated at all. It's a classic. Congratulations for the sequins. How pretty! I would love to win this pattern! Thanks for the giveaway! That is so gorgeous! I'm amazed at your patience. Love the color. giiiirl i am so happy you finished this!! eeee i think it's my favorite thing you've made... it actually beat out the hooded dress, which i lovelovelove. Stunning! I couldn't wait for your full post after seeing it on Sew Weekly. The colour is beautiful and I'm sew (!!) impressed with how neat the sequins look! Have shared on FB! Well done with all that sequin-ing! It looks great. Love the colour you chose too. By the by, I have so much respect for you for managing to complete garment a week. I can't even manage a garment a month!! I do admire your patience with the sequins, - not my sort of thing at all, but looks great on you. Don't enter me, I just wanted to say how lovely it is. Debi, it's STUNNING!! What a fabulous piece - you look regal and elegant. LOVE. This is gorgeous! The red is divine and perfect for the upcoming holiday season too! I remember admiring it on eBay about the same time you posted that you had bought and were getting started with your pattern! I would love to be entered to win it. Thanks! I adore this blouse on you and you did a fantastic job girl. Not entering but YAY! It looks so fantastic! Such a large amount of work, wow. But I think the really great thing about it is that the blouse doesn't seem too fancy, if that makes sense. 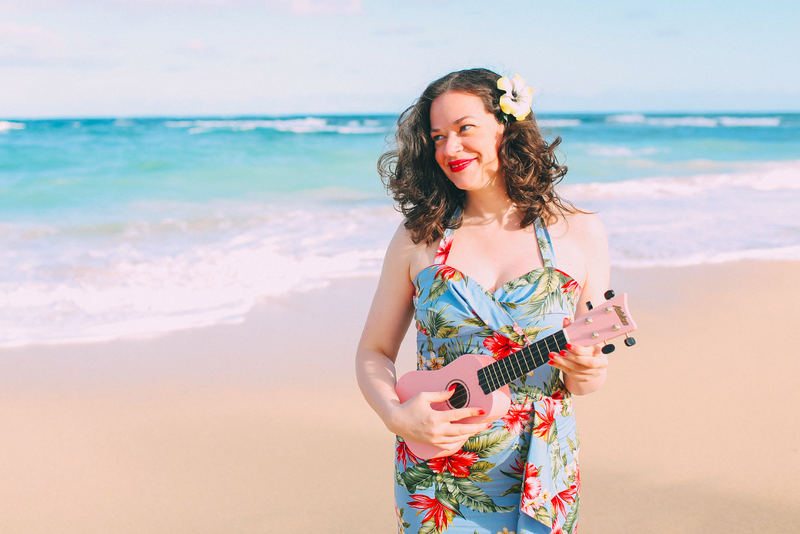 It still seems like you can get a ton of wear out of it and it doesn't have to be saved for a special occasion, which you might usually suspect with sequins. Awesome!! Oh my - it's beautiful! I would love to win the pattern and try to make one myself! Love your blog by the way! I live in Denmark, but are going to Glasgow tomorrow for a conference and was wondering if you know of any good vintage-shops in Glasgow? Thit (thitbirk@gmail.com) I don't have my own blog yet, but love to read others to get inspiration! This is lovely! I especially like the way the pattern carries on across the back. I think it would be fun to experiment with using sequins on basic items you already have that get neglected because they've a bit dull. 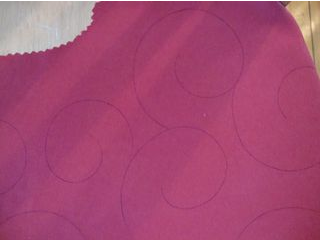 It wouldn't be too hard to create a customised pattern for the sequins to follow either. You look dazzling in this bedazzled top. I don't think I would have the patience to make this so I really admire your perseverance! It does make me rethink sequins. Red is most definitely your color! Count me in for the giveaway - you know I'm down with ridiculous amounts of hand sewing after my last project. Oh my god! As everyone else has already mentioned: It looks so gorgeous!! I am so very impressed! I appreciate how much effort you put into your beautiful wardrobe. I know when I make things I start off with that intent and quickly get discouraged. You are very admirable for that quality. Oh and I would be very happy to participate in the give away! Sorry I forgot to mention that! That's an absolutely gorgeous blouse, Debi! It is so pretty and has such great impact with all the sequins (oh, how I love sequins!!). Debi it looks wonderful! Great job on the sequins! Beautiful finished work and yes I would love a chance to win the pattern and give it a try! That looks so lovely! I have been wanting to make up something like this ever since I watched Dollhouse. One of the characters always has the most beautifully decadent beaded or sequined blouses. Wauw -you never stop to amaze me! You are so awfully talented! Debi, your patience is astounding! I am so impressed with this. The sheer amount of time the handstitching took, coupled with the finished product is a feat to be proud of...look at that smile! It must have been difficult to make certain there wasn't a bunch of puckery bunching, no? Wow i'm so damn impressed by those sequins! 20 hours, crazy! That blouse is fabulous! Everything you make is just wonderful, but this, I think, might just be my favorite! Awesome!!! you looked like someone who just walked out a Chinese movie and i loved the sequence on the blouse. I can't believe you put those sequins on that beautiful blouse. So stunning. Great job!